We are delighted to invite you to this year’s AGM! The meeting will take place on Thursday 24th November at 7.30pm in the Tullamore Court Hotel. Our keynote speaker this year is Professor Seamas Donnelly, Respiratory Consultant from Tallaght Hospital and Trinity College Dublin. His talk will be about Sarcoidosis – “What patients and their families need to know”. Speeches will be followed by an open forum for Questions and Answers. Light refreshments will be served. We hope to see you there, as your support is greatly appreciated! We are delighted to announce that Tullamore Golf Club is running a Golf Classic in August 2016 in aid of ISARC. We are sure this is shaping up to be a great days Golfing for any team that gets involved. April 2016 is Sarcoidosis Awareness Month. We have lots of events that will happen around the country to coincide with this drive for national awareness. We will update with a list of events happening shortly. We will update this section again shortly to provide some more detail on how you can get involved. The 5KM route was also reversed in order to have the course chip timed. The organising committee would also like to say a big Thank You to all our sponsors, registration team, stewards, photographers, kitchen team and everyone who helped out in any way on the day. We would also like to thank all the Athletics Clubs for their continuous support of our event especially Tullamore Harriers for all their help and guidance over the years. 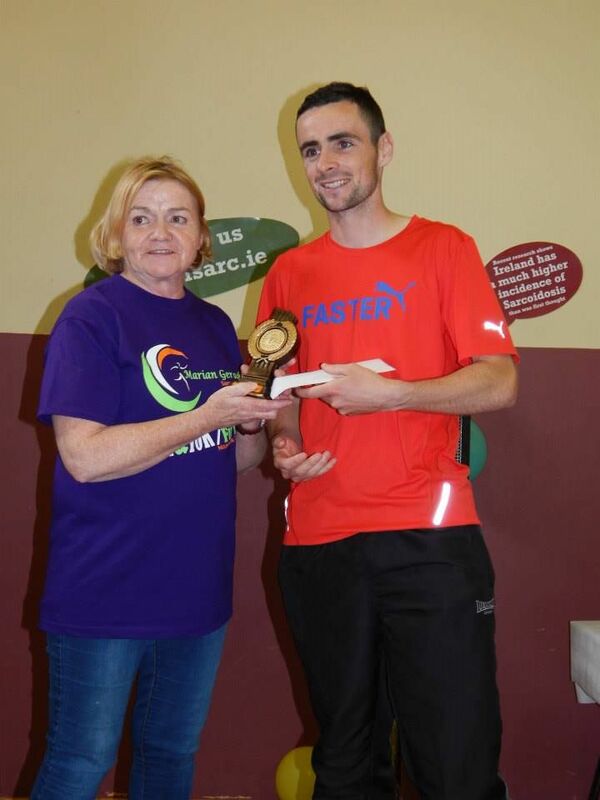 Big Thanks also to all the runners, joggers, walkers and families who came out and took part in the event, your support is vital to the success of the Marian Geraghty Sarcoidosis 10KM/5KM Road Race/Fun Run. We hope to see you all again on Sunday, 2nd July next year! The 12th annual Marrian Geraghty Trust 10KM/5KM Road Race/Fun Run took place in Mount Bolus on Sunday 5th July. This event was first organised in July 2004 by Marian Geraghty’s family to mark what would have been her 50th birthday. Marian had lost her battle with the rare condition, sarcoidosis, a disease she had been diagnosed with more thad 20 years earlier. Over the years we have seen increasing numbers attend and participate in the event. This year a record 314 runners, joggers and walkers took to the roads around Mount Bolus, Co. Offaly to enjoy and compete in the glorious sunshine and friendly atmosphere. This year’s event proved to be a huge success with the addition of chip timing to the 5KM course as well as the 10KM route. We were very fortunate to have the Grennan Family from Rath, Birr, Co. Offaly on board. The fabulous souvenir t-shirts were very kindly sponsored by Brian Grennan Transport Ltd. The organising committee and all involved are hugely grateful for their generosity. Over the past 12 years funds raised from this event have been donated to aid awareness and research into this very unpredictable disease. Professor Seamas Donnelly (medical advisor to ISARC) and his team at St Vincent’s University Hospital, Dublin has been at the forefront of this research. 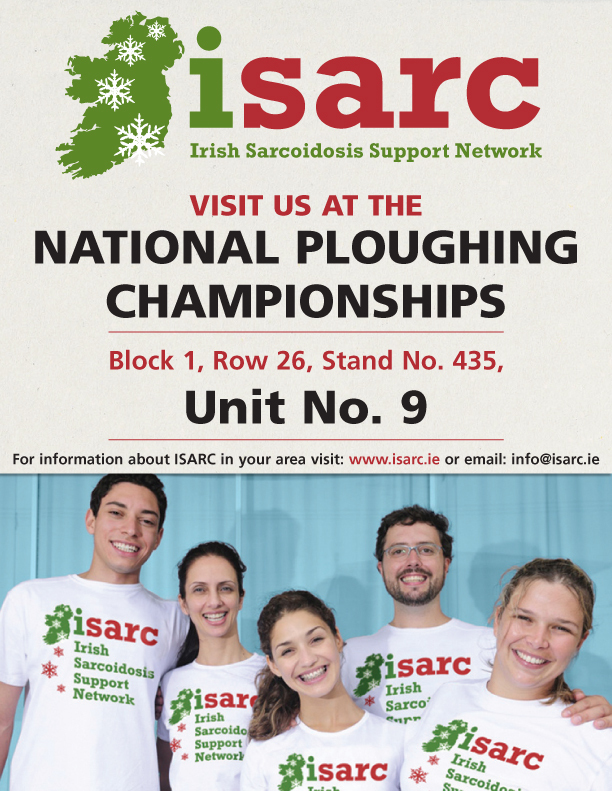 More recently, funding has been directed to ISARC, the Irish Sarcoidosis Support Network to provide information and support to sarcoidosis suffers and their families.